A comics author whose work became an online sensation has credited his time at Wrexham Glyndŵr University for giving him the confidence to take “a leap of faith” into the profession. 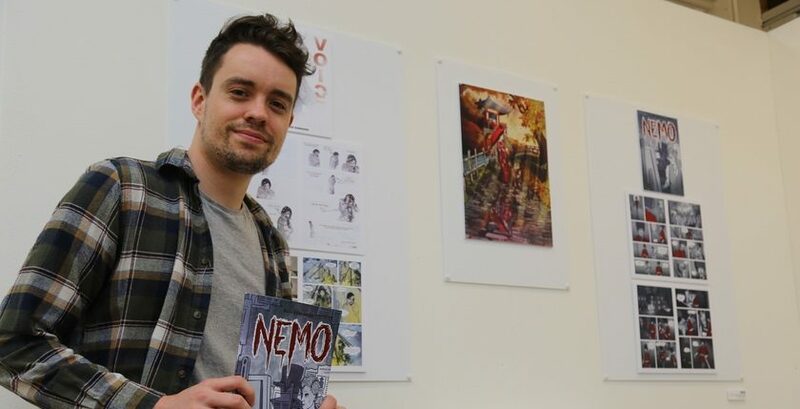 Ben Edwards, 26, from Burnley, produced Nemo, a one-shot horror comic based around the Jack the Ripper case, with publisher Blue Fox Comics. A student on Glyndŵr’s BA (Hons) Illustration, Graphic Novels and Children’s Publishing course, Ben’s work was published last month and is already proving popular with readers. Ben explained: “The book is a retelling of Jack the Ripper. It plays with a conspiracy theory that the artist Walter Sickert could have been Jack – it follows him and eventually, he gets to a point where he has to choose between being Jack the Ripper and being an artist. Ben spoke to lecturer Dan Berry – who is also a published comics author – about the project, which he used as part of his final year work. “At the beginning of the third year, I started work on the book in earnest, and I finished it just before Christmas,” continued Ben. “At that point, the publisher was looking to start publishing the book later this summer. “Then they decided they were going to bring the publication date forward. We put the book up on Kickstarter, an online funding site, in the spring, and it hit its initial funding target of £1200 in just over a day. He has credited Glyndŵr with helping his development as a writer and illustrator – and for giving him the confidence he needed to succeed. He said: “It has been fantastic coming to Glyndŵr. I wasn’t always an illustrator – I used to work full time. When I left school, I didn’t think I was good enough to do art. “I worked in customer service jobs, cleaning jobs and things like that – I was happy enough, but I felt like something was missing. “Then, I started doing my own children’s book for fun, and that picked up a little bit of interest so I looked into doing more. That’s when I came to Glyndŵr to do the course here – and they have helped me so much! “It’s about taking that leap of faith – and coming to university gave me that confidence. Dan Berry, programme leader on Glyndŵr’s BA (Hons) and M Des Illustration, Graphic Novels and Children’s Publishing course, added: “It’s great that Ben is realising his potential – and that people are finding out about his work. “Over the past three years, it has been great watching Ben develop and grow in confidence – helping people like Ben to realise their potential is one of the privileges of working at Glyndŵr. You can find out more about the BA (Hons) and M Des Illustration, Graphic Novels and Children’s Publishing course here.